Doesn’t it look like an underwater creature, but velvety. And here it is used in a bouquet. 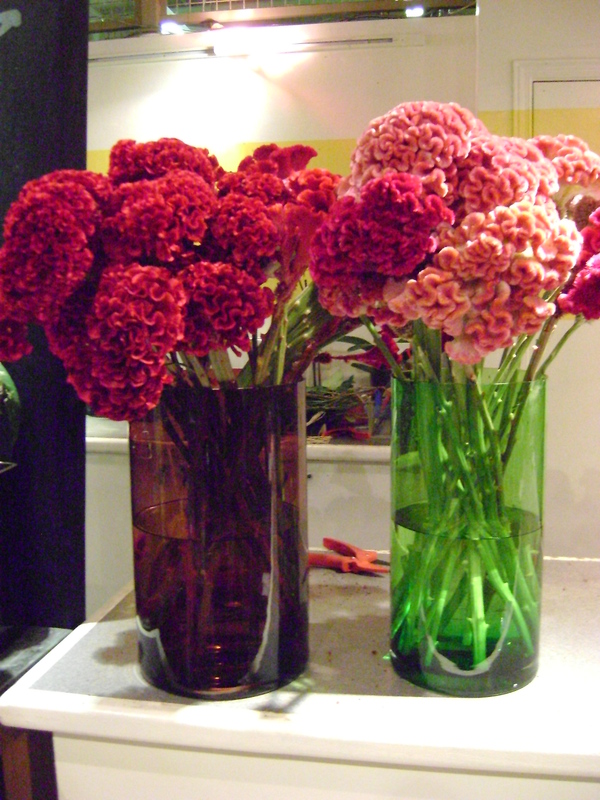 Celosia is a great annual that we are using a lot of lately. It is locally field grown, we start getting in the shop around the first of August and it will go until there is frost. We get two different varities of celosia, the feather (looks like a feather) and the cockscomb, which is my favourite. 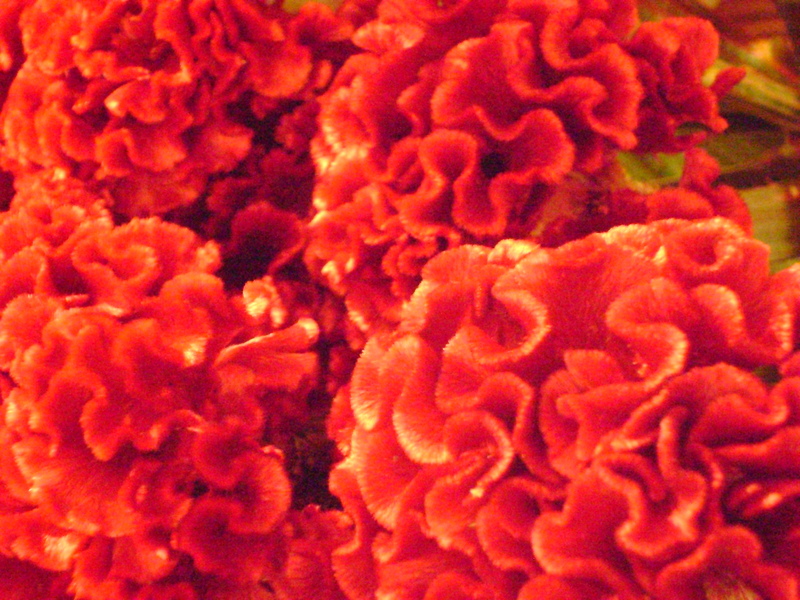 Customers are always inquiring what kind of flower this is, they are amazed by the velvety texture. The shop is looking very pink these days. I love dahlias. 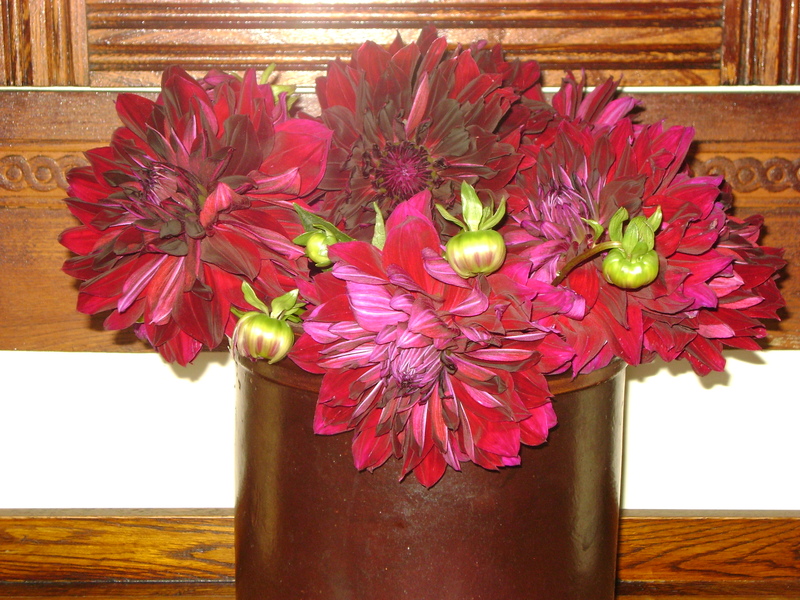 At this tine of year, dahlias are going into every arrangement that I make at the flower shop. A: As we try to be very seasonal, they are the new flower in season. 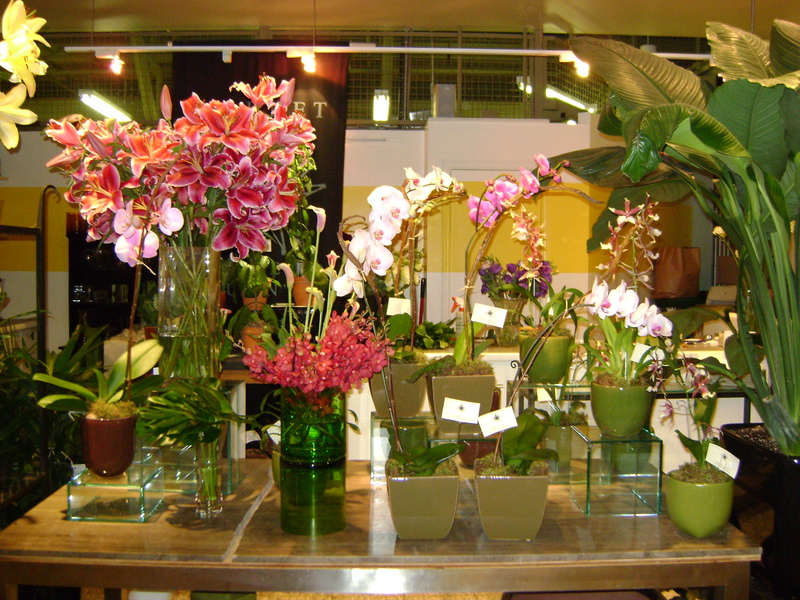 B: They are huge and cheap, two words that floral designers love to hear. C: So many yummy colours and shapes. 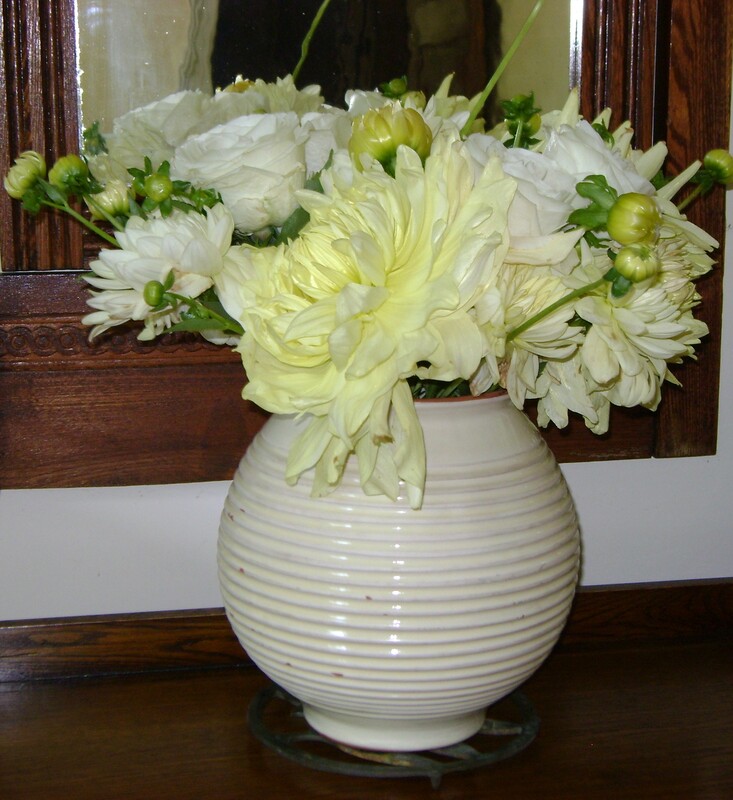 This arrangement has two sizes of very, very, pale yellow dahlias, and a creamy rose. I love monochromatic arrangements. These are actually old flowers from the store and this is in my kitchen at Kilbourne Grove. This is a really lovely one, the flash of the camera really changed the colour. It is a very dark red, almost black, very velvety looking. It is such a shame the season is so short. We buy these at the Food Terminal from a local grower. They are not available until late summer and will end with the first frost. A lot of sunflowers at the shop lately. We have a longer season for sunflowers than we do for dahlias. 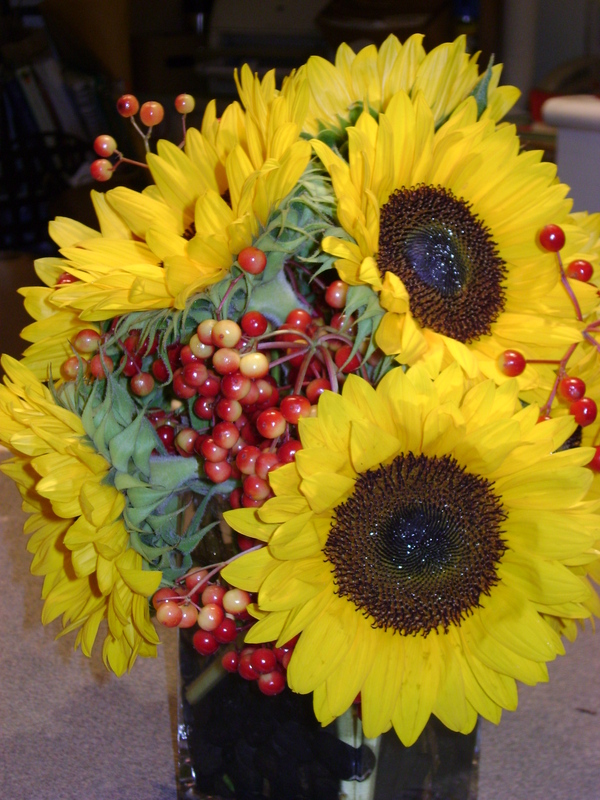 We can buy imported sunflowers, but they are always more expensive. Sometimes, it the petals on the sunflower are wilted, or spotty, I will pull off all the petals, just leaving the seedhead in the middle. People are always surprised, and tell me they never would have thought of that! People love sunflowers. This is something that I have learned over the years I have been a floral designer. They also love gerbera daisies. 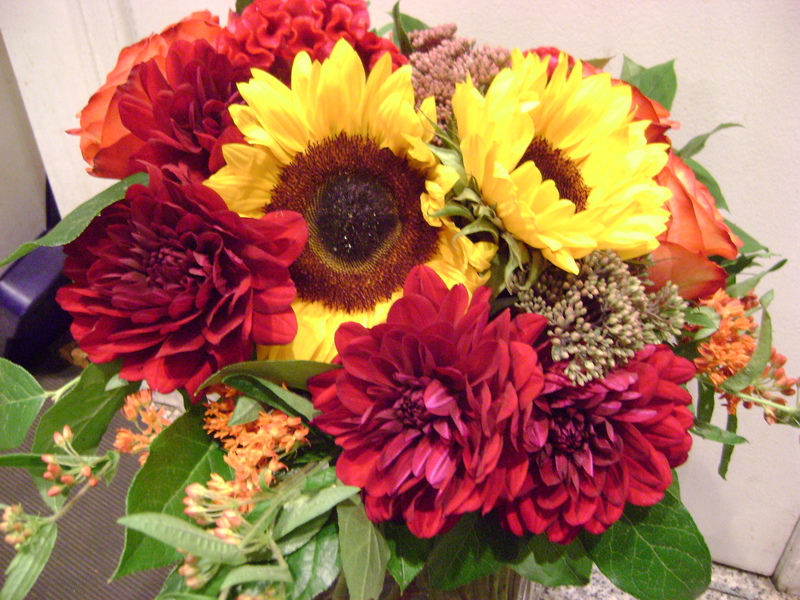 They seem to be two of the favourite flowers that people will request in an arrangement. I love sunflowers now, not so much the rest of the year. 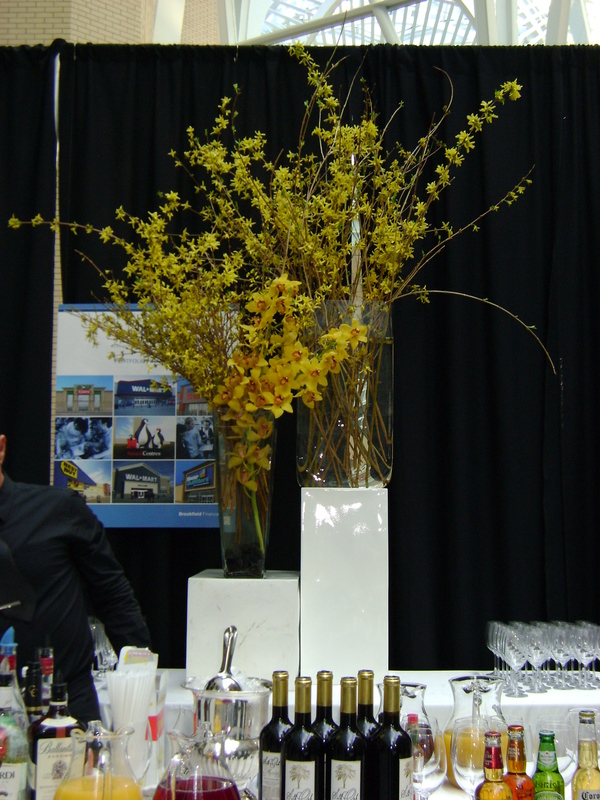 For me, and for a lot of floral designers you are always ahead of the season. 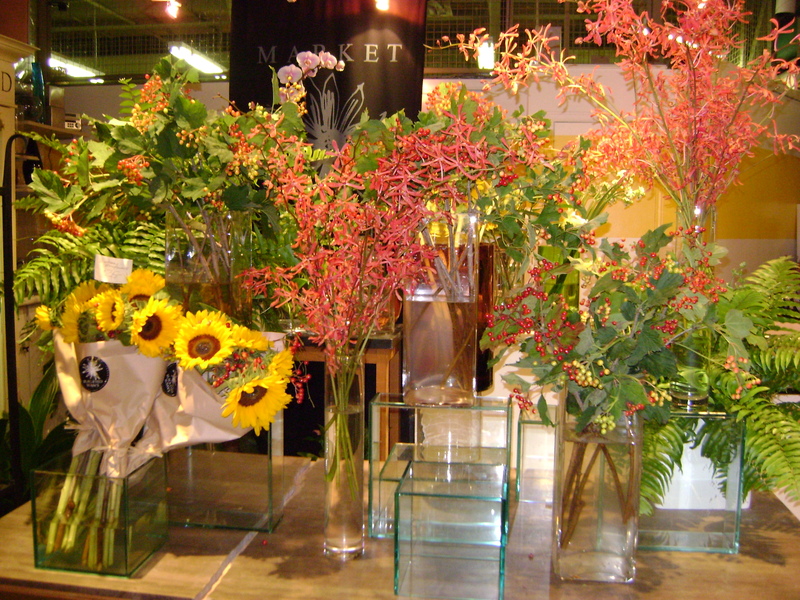 Commercially grown flowers are aprox one month in advance of Mother Nature and our designs reflect this. By the time one season arrives naturally, I am ready to move on to the next. We have been purchasing a lot of the autumn flowers at the shop lately, sunflowers, dahlias, sedums, celosia etc and this put me in the mood to make this arrangement. 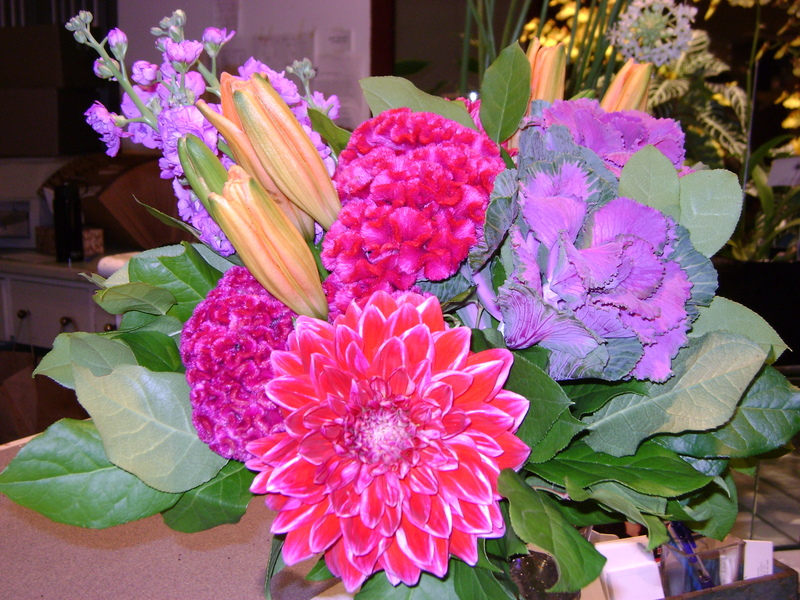 This hand tied bouquet also includes roses and asclepia or butterfly weed.